Our hero stops in China and stays for a year. In a photo from a family album, Starrett is shown with Admiral William H. Allen aboard the Dollar Line ship the SS President Wilson, probably on their way from California to a port in Asia. Thanks to Studies in Starrett friend Ira Matetsky for sorting out the details. He had tasted travel as a teen, working his way across the Atlantic to England, where he roamed penniless from one author's home to the local Salvation Army or similar group accommodation. He came back wiser, but his thirst for adventure was not sated. When U.S. troops threatened to get involved in a Mexican Civil War in 1914-15, Starrett was a reporter for the Chicago Inter-Ocean. He talked his way into becoming a war correspondent, and learned that war was far from the glorious act praised by childhood writers like G.A. Henty. Nevertheless, the influences of his childhood reading could not be easily shaken. Those books sparked in Starrett a desire to travel that extended well into his adulthood. And when—for the first and only time in his life—he found himself flush with Hollywood cash after selling a novel for adaptation to the big screen, he and Ray went on a round the world tour. For a while, it looked like they might never go back to Chicago. 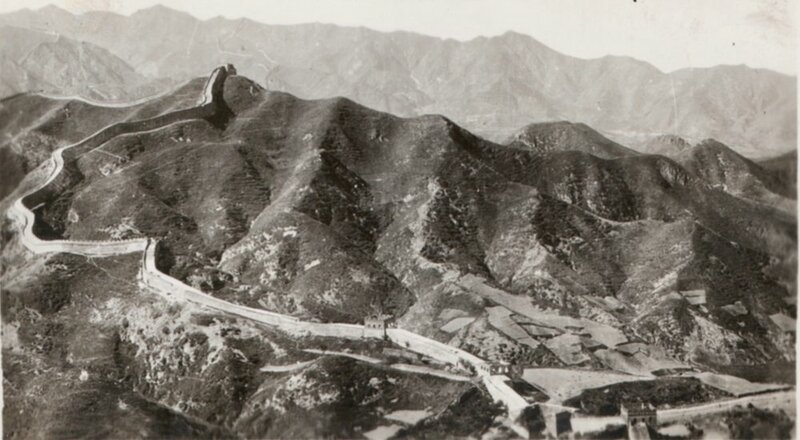 The Great Wall of China snapshot from a Vincent Starrett family album. The original is tiny, just 2.5X4 inches. Starrett and Ray eventually made their way to pre-revolutionary China, where he planned a brief stop to do a little souvenir and book buying before heading on to Europe. Here is how he tells it in his memoirs, Born in a Bookshop (p. 293). The better part of the next 18 months were spent as residents of the city. He eventually “rented a house and compound of my own so close to the Forbidden City that I could see its fabulous red roofs from my bedroom window.” For Starrett, who lived most of his life in tiny apartments or residential hotels, his home in Peking was a palace. The 14-room house came with nine servants and were rented, "at the price of a simple apartment in Chicago." Accompanying this section are photos of Starrett and Ray in the entrance of their home in Peking, now Beijing. Wealthy by local standards, the two were able to lead relatively lavish lifestyles in this exotic world. In his bibliography of Starrett, friend Charles Honce says Starrett was "having the time of his life" in the city. These photos reinforce that view. It's a shame we don't have pictures of the inside of the house. Peking afforded Vincent and Ray one other opportunity: A time to be truly together. Vincent was separated from his first wife and was desperately trying to divorce her so he could marry Ray. While the two were in Chicago, they had to be covert about their relationship. But here, far from the Windy City's judgmental eyes, they lived as husband and wife in deed, if not in law. Perhaps that's why, as Honce says, he was "having the time of his life." There was an ex-pat colony of American and British writers already living in the Forbidden City, along with the usual gaggle of newspaper reporters. Starrett naturally fell in with the crowd, being able to lay legitimate claim to both groups. On back of this tiny snapshot, Starrett has written, "The Buddhist 'Heaven' a sculpture in the Winter Palace, Peking." While the continent was different, Starrett said he now better understood the era of his François Villon, the French medieval poet who fascinated him. At the same time, he was surprised to find himself depressed by "weight of time" that was ever present in the city. Here's how he explained it. “Palaces, temples, pagodas, sacred mountains and all the rest of the phantasmagoria left me cold, and I got away from them as quickly as possible. There was more to it than simple boredom; I actively resented it all. Ray and Vincent in matching rickshaws getting ready to leave their home in Peking for a night on the town. It sure beats taking the El back in Chicago. What kept him in the city was his joy in living with Ray and his obsession with finding Chinese detective stories in the equivalent of their dime novels, not to mention the friendly association with the Eastern wastrels lounging there. One of their leaders was Helen Burton, whom we will say more about next time. Her home was ground zero for visiting celebrities, including Warner Oland, the Swedish-American actor who made a career speaking halting English as Dr. Fu Manchu and Charlie Chan. By the spring of 1937, life in the ex-pat Shangri-La was no longer care free. Starrett became ill and needed to be hospitalized. He doesn't describe the illness, but later told Honce that doctors had ordered him to leave. His physical discomfort echoed the unrest growing through the region, as the beginnings of the Sino-Japanese War stirred. So much for danger and adventure. Next time: The Chinese adventure in fact and fiction. The fellow in white, hidden by the rickshaw driver, is Hsu, Starrett's chief servant while living in Peking. Notice that even while in China, Starrett still managed to find a cigar.